...Didn't make me feel so fine. Well friends, I sure screwed up and to tell you the truth I saw it coming from a million miles away. Last night Carrie and I decided to sit down and watch my favorite Christmas movie, "Christmas Vacation". After my 'Wine and Cheese' birthday party we had quite a bit of wine (and cheese) left over, including some bottles that were brought as gifts. I'm not complaining, quite the opposite, just setting up the story. Well I figured I would sit down and watch the movie with a glass of one of the reds that was given to me. Clark had jus discovered that his tree was a bit 'pitchy' when the land shark struck. Clyde launched at my glass of wine when I wasn't looking, spraying wine every where. My shirt, hair, face, wall, carpet, and the couch. The carpet isn't a big deal at all as it is the same color as the wine. The couch, however, isn't. There was red wine on half of the cushions and pillows. Being a sectional, that is a lot. Basically it was time for a freakout (by me). No, we didn't beat the dog, but he got to go to his kennel. It was his wild time and we didn't need to be keeping and eye on him while trying to save the couch. Carrie jumped on the internet and came up with a solution of a cup of hydrogen peroxide and a tablespoon of laundry detergent. We blotted the countless spots with that and then used a diluted solution in our small carpet and upholstery cleaning machine, the Bissell Little Green. This thing is a must have if you have an indoor dog or anyone spill-prone. After all the commotion and a crappy day at work*, I was done for the night. I went to bed and slept for ten hours, a rarity for me. The good news is after inspecting everything this morning, the only loss is an undershirt that we ignored. I couldn't find a trace of the wine on the couch, thank God. Lesson learned, no red wine while siting at the couch with the dog during crazy time. If I would have waited a half an hour he would have been curled up on the floor 'not' snoring. (heh- mom, sister, though their dogs would have to work quite a bit harder to cause the damage that Clyde did with a single lunge.) Have I said before that I can't wait for the puppy phase to pass? 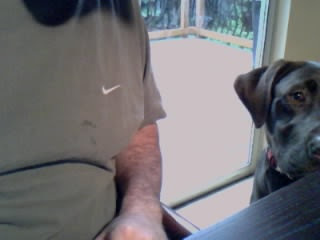 That is jowl slobber on my shirt... He like to share. * Note- I had a file that I had spent all week working on crash. It would not open. After two hours of trying different things I got it to work, but a few more gray hairs popped out of my head in the process. I had an incident like this happen at my christmas party. i about fainted, and i cried. 10 people got it out though. my parents dont know and there is no sign. thank the heavens above. red wine + white carpet + 16 drunk preschool teachers = big mistake. They know now.... I just forwarded this too them.